Friday 22 April was meant to be a busy day for the Fachschaft Wirtschaft Olten. Besides the annual event in Innsbruck, the study-trip to Poland also got started. 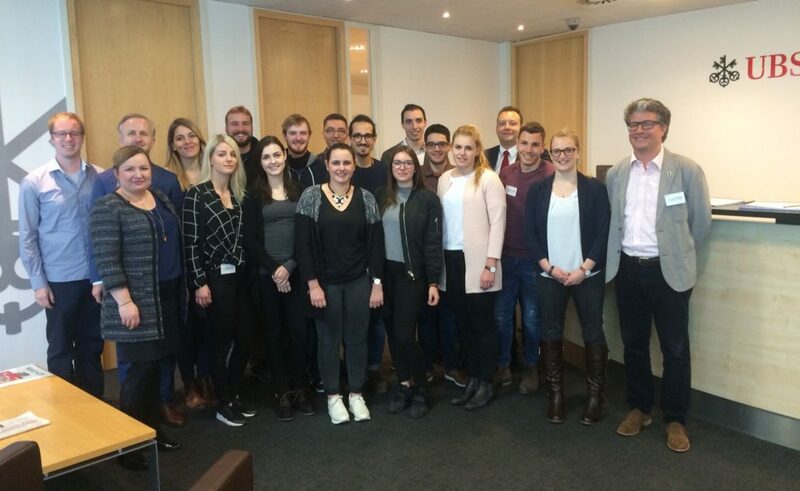 At 11am a delegation of 15 students plus Lecturer Marcel Hirsiger boarded the EasyJet flight to Cracow, Poland. On Friday and Saturday morning we enjoyed the wonderful weather in Cracow and did some sightseeing. Saturday evening was organized by ESN Cracow, with first a meal in a nice and traditional polish restaurant, and then a one hour tram party, as well as an ESN party. Thanks again to Agata for organizing the whole thing! Lower temperatures and a cold wind awaited us on Sunday, which went along with our visit of the KZ Auschwitz/Birkenau, one of the most famous yet also saddest historical places in Poland. 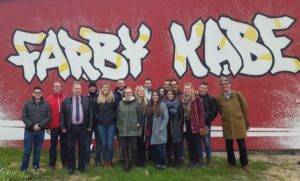 On Monday 25 April we spent the whole day in Katowice, a former coal industry city. 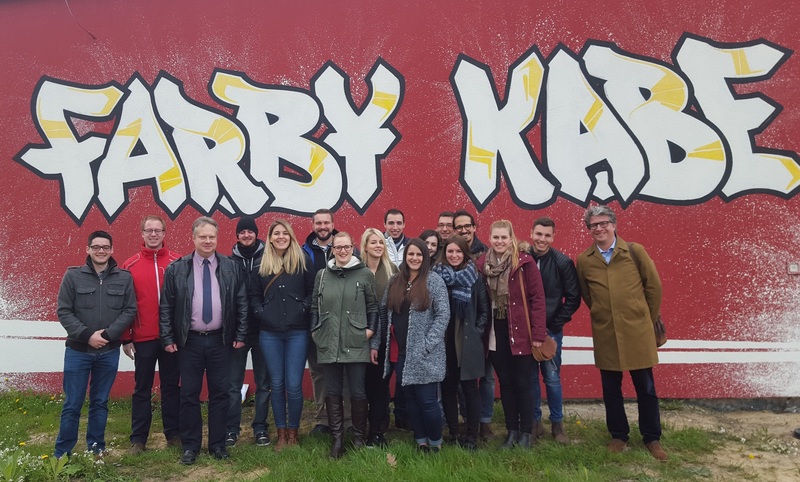 In the morning we had the opportunity to visit Farby KABE, a company producing colors and plaster for construction. The director Mr. Noculak showed us the whole plant and kindly offered us a typical Silesian meal. After that, we went straight to our partner university, the University of Economics Katowice. Ms. Lipczak from the International Office organized a diverse program for us. First, we had the chance to participate in a lecture and see the campus of the university. In addition, a city tour of Katowice and an excellent dinner left us with a truly positive image about the city Katowice. Though Tuesday 26 April was already our departure day, there was still one major appointment on the agenda: the visit of the UBS Business Solutions Center in Cracow, where about 3’000 people are working. We were hosted by Mr. Ostrowski and his colleagues from the finance department, which is led by Mr. Steinmann, FHNW Brugg Alumni (unfortunately absent due to a business trip to India). Mr. Ostrowski provided us with a deep insight into their activities and how UBS is functioning. At 4pm we headed back to Switzerland. Some tired or on the verge of getting a cold, but this study-trip was very enriching and opened up Poland to us. We hope that there will be similar trips in the future!